Two years ago I asked 300 different online marketers to help me figure out how they were using visual content as part of their marketing strategies in 2016 and their predictions for 2017. You can jump ahead in this article to look at the results from that survey by clicking here. 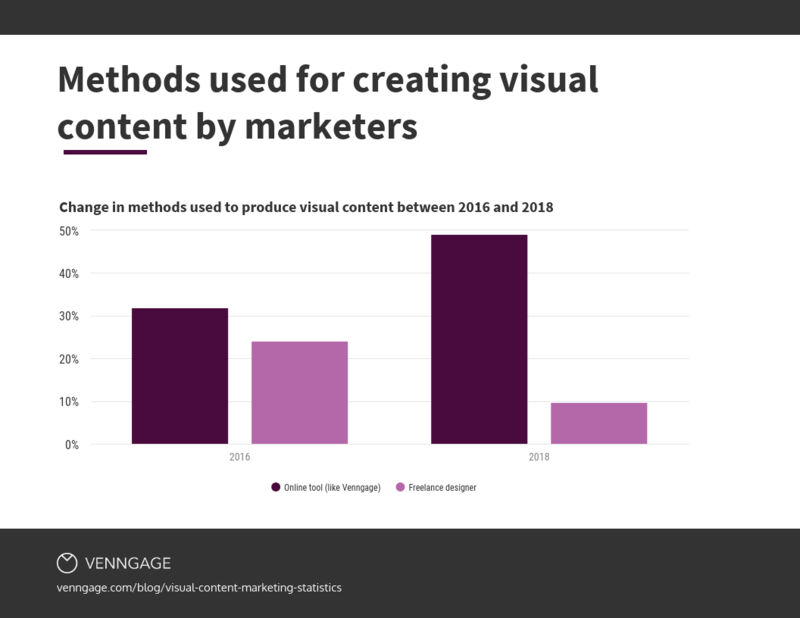 This year I wanted to see if there were any changes in how marketers were creating visuals, and what kind of content engagement they were seeing. I also asked a couple of additional questions to see how the use of various visual formats impacted their blogging strategies. Here are the stats you need to know if you want your content marketing strategy to be ahead of the curve in 2019. When asked, 44.6% of marketers stated that between 91-100% of content their published in 2017 contained some type of visual. This is about a 10% increase from what was stated in the year 2016, when we first put together this survey. 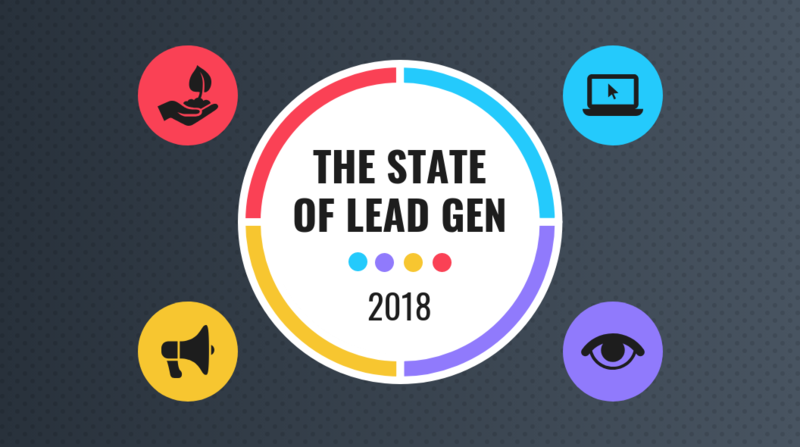 However, in 2018 the percentage of people who visuals in their content 91-100% of the time rose to 56.3%. That’s almost a 40% increase since the year 2016. On top of that, 87.5% of marketers state that they were using visuals in more than 50% of the articles they published. 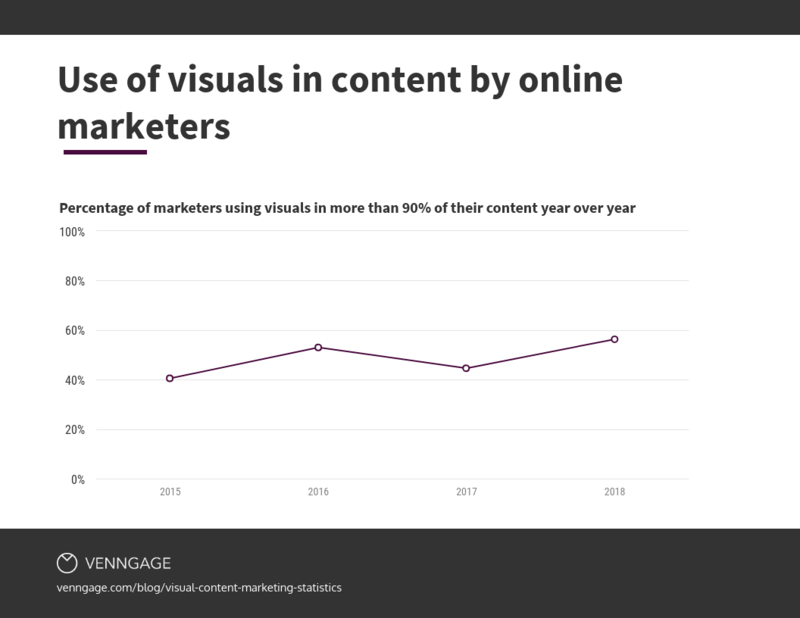 Needless to say, the frequency at which marketers are taking advantage of visual content is trending up. Memes and Gifs: Defined as humorous visuals with some means of pop-culture reference. Charts and Data Visualizations: Specifically the visualization of raw data only, or complex data sets. Videos and Presentations: Either webinars, animated videos or recorded videos embedded within their content. Infographics: A combination of data and graphic design elements, including visual formats like posters, flyers or banners. Stock Photos: High-resolution photographs from directories not limited to Unsplash and Shutterstock. In 2018, 40.2% of marketers stated that they used stock photos the most in their content. This was followed by 36.6% of marketers who said they preferred using original graphics, such as infographics more frequently in their content marketing. Other visual formats like charts and data visualizations were used frequently by 12.5% marketers, videos and presentations used most frequently by 7.1% of marketers, and gifs and memes were used most frequently by only 3.6% of marketers. Enhance your visuals and choose from thousands of high-quality stock photos in Venngage’s Image library. Of course, what matters most is how visual content is performing. Despite using stock photos the majority of the time, 40.2% of marketers who were surveyed said that the visuals which performed best were actually original graphics such as infographics and illustrations. 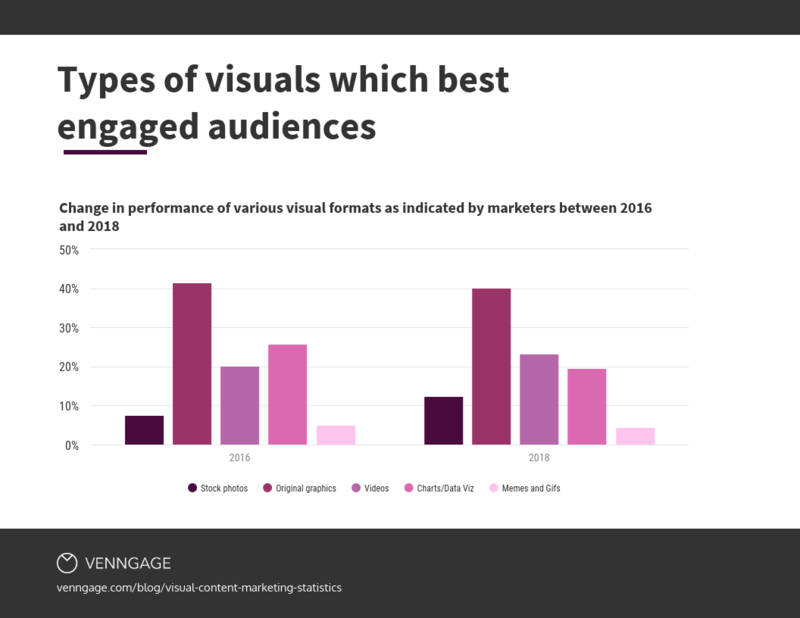 This was followed by 23.2% who said that videos and presentations performed best, 19.6% who admitted that charts and data visualizations lead to higher engagement and with only 12.5% of marketers stating that stock photos engaged audiences best. Memes and Gifs seemed to have the lowest engagement with 4.5% of marketers stating they saw an impact here. Curious as to what extent the use of visual content actually impacted content engagement, we decided to take a look at some our top performing articles in terms of engagement (looking at metrics like the average time on page and bounce rates of certain articles) and compare them to articles that had lower engagement. We found that on average, articles which contained a higher ratio of visuals performed substantially better. Of course we can’t say for sure until we test out this hypothesis a bit more, but we can assume that the more frequent use of visuals and not just the format, also has an impact on engagement. 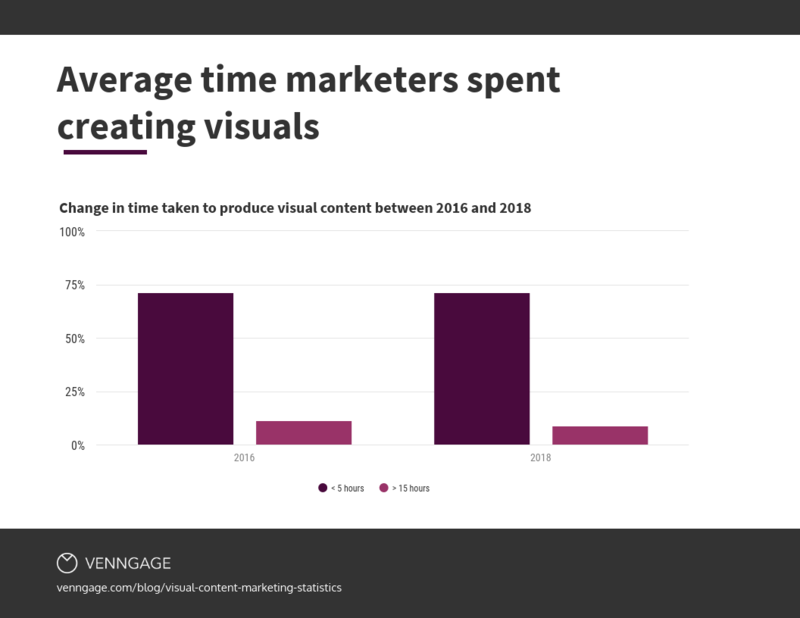 When asked how long they spent on average, producing visual content, 71.4% of marketers stated that they typically spent anywhere less than 5 hours making visuals. This is almost identical to the data we collected during our 2016 survey, where 71.1% of marketers stated they spent less than 5 hours creating visual content. However, 9% of marketers claimed to spend over 15 hours a week producing visual content compared to 11.4% in the 2016 survey. Overall, it seems like marketers are making better use of their time when it comes to visual content creation as a whole. We also asked how marketers went about producing their visual content in 2018. In 2016, 32% claimed to use an online tool like Venngage. That number has increased substantially and this year, 49.1% have admitted to using an online graphic software. This is almost a 60% increase in the past few years. That means that far fewer marketers are relying on freelancers and in-house graphic designers for their visual needs. In fact, only 9.8% of marketers stated that they used a freelance or contract designer for their marketing visuals, which is roughly a 150% drop from 2016 when 24.1% of marketers mentioned using contracted designers. 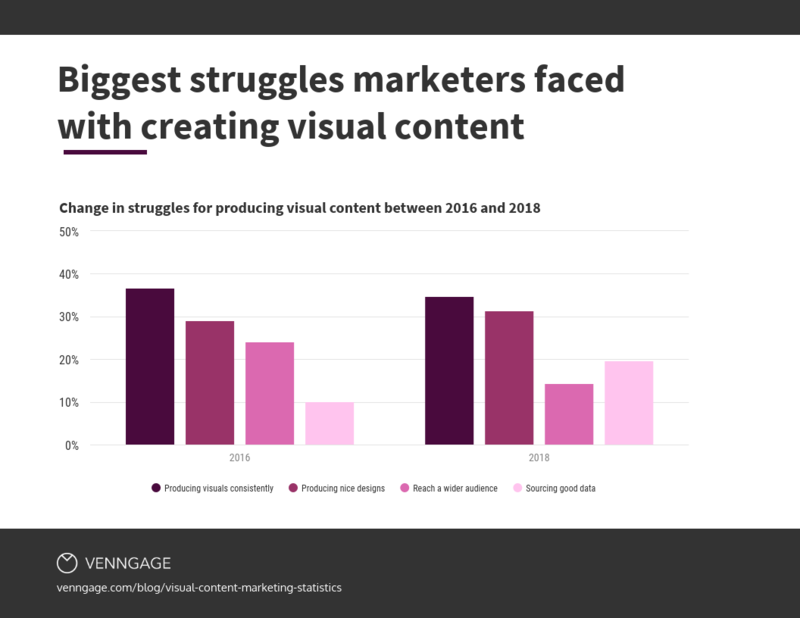 When asked what their biggest struggles were when it came to producing engaging visuals, 34.8% of marketers said it was being able to produce it consistently. This is a small drop from 2016 when 36.7% of marketers were struggling with consistent production of engaging visual content. Following this, 31.3% said they struggled with creating great designs, 19.6% struggled with sourcing good data or content for their designs, and 14.3% said they struggled with getting a wide enough reach with their visuals. Comparatively, it seems that marketers are definitely getting a much more impactful reach from their visuals since in the 2016 survey, 24.1% said they struggled with reaching a wider audience. But it also seems that more marketers are now struggling to figure out which content or data to include in their visuals, as only 10.1% were facing difficulty with this in 2016. In 2018, 42% of marketers said they spent less than 10% of their marketing budgets on producing visual content compared to 31.6% from the year 2016. What’s interesting here is that marketers also stated a higher frequency in their visual content output. What this suggests is that marketers are continuing to find cheaper alternatives to producing quality branded visual content. You can now apply your branding directly to your Venngage designs in one click! More interesting is that 16.9% of marketers claimed to spend more than 30% of their marketing budgets on visual content creation, a drop of almost 50% from 2016, when 25% of marketers stated spending over 30% of their budgets on visual content. We also asked how much marketers projected to spend on creating visuals in 2019. 32.1% projected to spend more than 30% of their budgets. This was a similar prediction to the previous survey we did in 2016, but it appears that it did not hold true, since the amount being spent seems to be on a decline. That being said, 29.5% of marketers predict to spend less than 10% of their budgets on visual content creation. 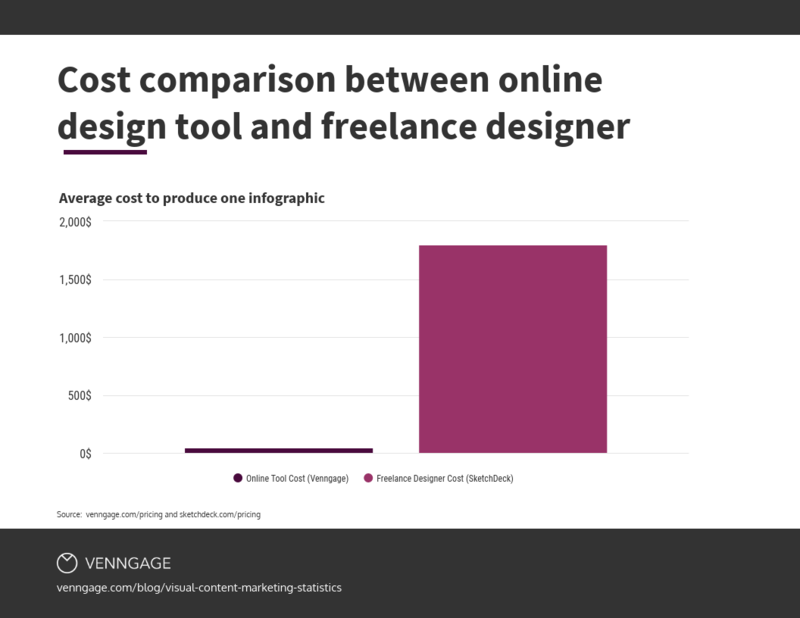 It makes sense that more marketers are spending less money on visual creation considering the adoption of online graphics tools has greatly increased, and the overall cost for a tool compared to a freelance or in-house designer is substantially lower. We also asked marketers to indicate on a scale of 1 to 10 how difficult it was to consistently produce branded visuals and 47.4% of marketers voted 7 or higher. 32.1% said somewhere between 4 and 6, and 20.6% gave a rating of 3 or less. Needless to say, on of the biggest struggles for marketers in 2018 was to consistently produce branded visuals that looked good. At Venngage, we took this feedback to heart. The feature My Brand Kit enables you to apply your brand colors and logos directly to any design you create with Venngage. Rather than having to manually produce unique branded content for every campaign, you can generate custom designs in one click. We also wanted to ask marketers what part of the visual creation process they wish could be automated, and 42.2% hoped that they could generated multiple unique designs based on the content or data they input. Following that, 28.7% wished they could automatically resize the visuals they created for various social media platforms, and 16.1% wished they could automatically apply their branding to their visuals. In an effort to make this dream a reality for our audience, we began working on an advanced design automation platform that not only generates multiple unique designs based on your data, but also automatically resizes those visuals for various platforms AND applies your branding directly to the visuals you create. As we move into the next couple of years, it’s clear that there is more of a demand from marketers for the ability to automate their visual content design. When asked how important visual content was to their marketing strategies, 68.7% of marketers said visual content was either very important or absolutely necessary. Others, that being 21.4% said it was quite important to their marketing strategies, 9.8% said visuals were somewhat important and not surprisingly, nobody said that visual content was not at all important or relevant for their marketing in 2018. Since visual content has multi-channel benefits, we wanted to learn more about how people were creating visuals as a way to enhance their blogging efforts. Of the marketers we surveyed, 87.5% said they blogged frequently and that it was in fact an important part of their marketing strategies. 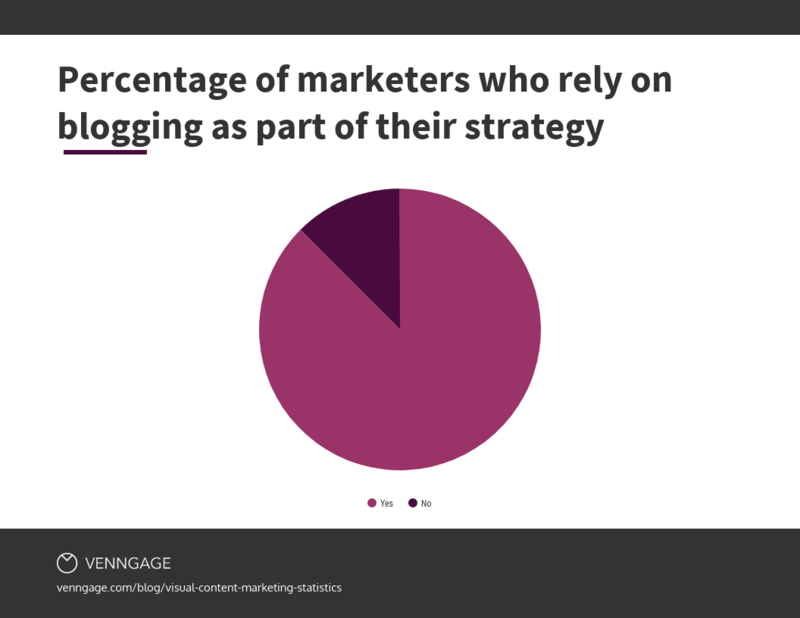 The other 12.5% said that they didn’t blog as part of their marketing strategy. Of those who said they did blog as part of their marketing efforts, 85.7% said that more than 80% of their blog posts contained some type of visual. 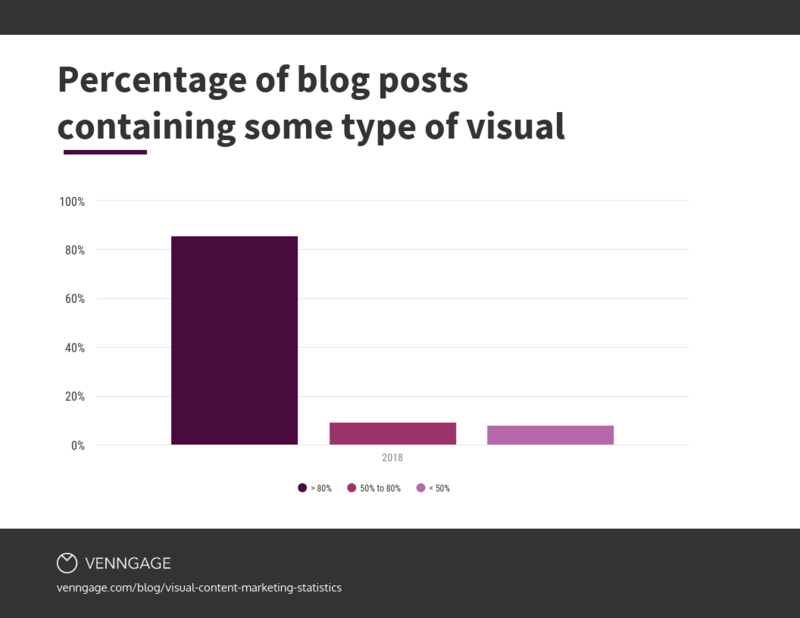 9.2% said that between 50% and 80% of their blog posts contained at least one visual, and the remaining 8.1% said that less than 50% of their blog posts contained visuals. As mentioned earlier, we’ve seen better performance from articles we’ve produced that contain a higher visual to text ratio. These articles tend to rank higher on SERPs and also lead to better direct conversion rates. 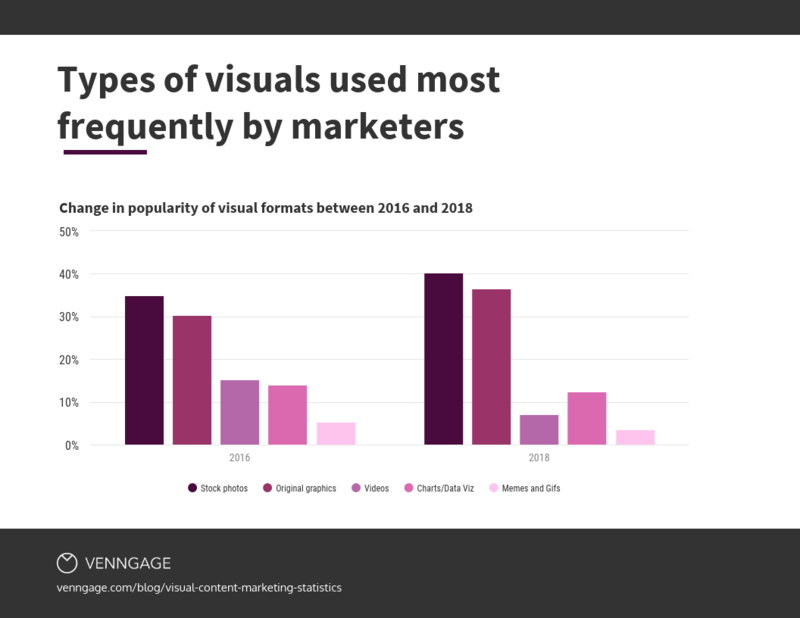 Lastly, we asked marketers to tell us what percentage of business they thought would rely heavily on visual content in 2019 and 2020, and 45.5% predict that more than 80% of businesses would rely heavily on visuals as part of their marketing efforts. Following that was 42% of marketers who foresee between 50% and 80% of businesses relying strongly on visual content. And the remaining 12.5% believe that less than 50% of businesses would heavily rely on visual content. 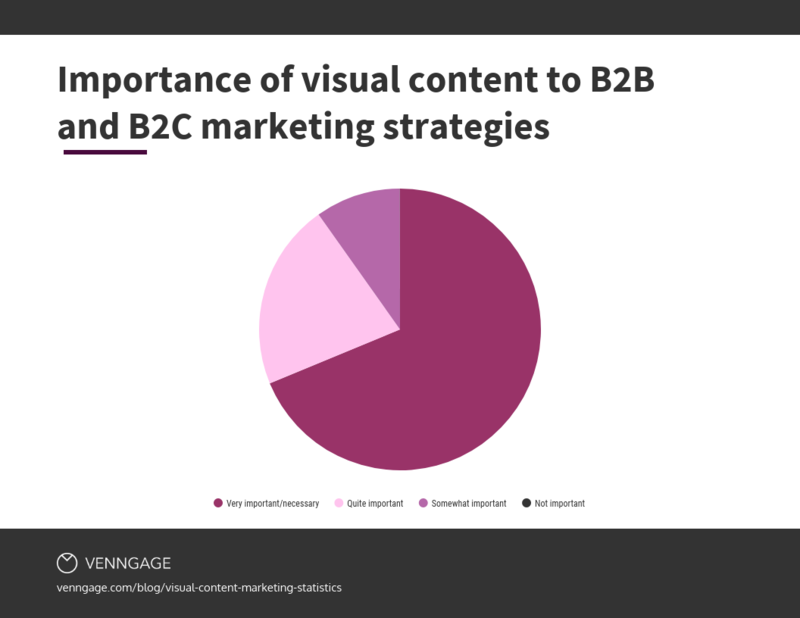 It appears that for the most part many marketers consider visual content to be an integral part of the growth initiatives, and believe that more and more businesses will adopt visual communication in the coming years. The data says it all–visual content isn’t going anywhere any time soon. Not only are more brands leveraging the use for of visuals for various social media platforms, but there is a lot of added benefit when it comes to SEO and organic rankings as well, particularly in Google’s image search results. And of course, creating engaging visual content is a surefire way to resonate with your audience and communicate your ideas more effectively. 1. What percentage of content published contained visuals? When asked, 77% of marketers stated that 71% to 100% of the content they published in 2015 contained visuals. Of that 77%, 40.5% of marketers stated that 91% to 100% of the content they published in 2015 contained visuals. But when asked about their use of visuals in their content strategy during the year 2016, 83.5% of marketers stated that 71% to 100% of their content contained visuals, and 53% of marketers said that 91% to 100% of their content contained visuals. In 2016, less than 10% of marketers surveyed used visuals under 50% of the time. From 2015 to 2016, the use of visual content in articles published by marketers increased by an incredible 130%. 2. What kind of visuals were most frequently produced? 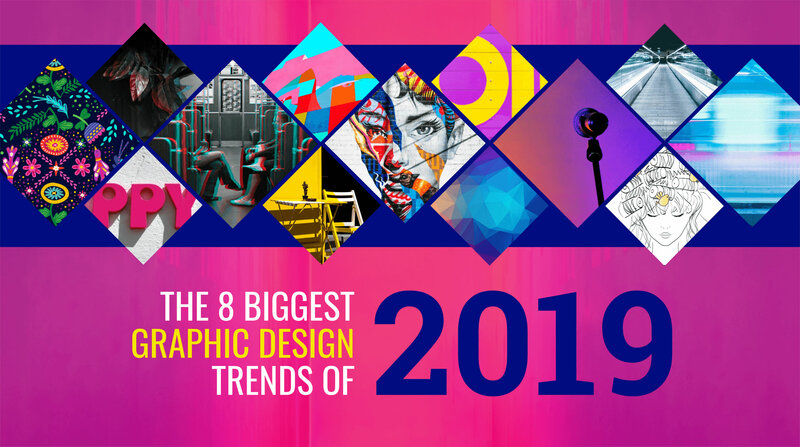 When asked what types of visuals were most frequently produced during the year 2016, 35% of marketers stated that they used stock photos the most, while 30.4% of marketers stated that they used original graphics, such as infographics and illustrations, most frequently. The other forms of visual content that were most frequently produced were videos and Presentations (such as SlideShare presentations), which were used 15.2% of the time, charts and data visualizations, which were used 14% of the time, and GIFs and memes, which were used only 5.4% of the time. 3. Which visuals performed best? Marketers were also asked to share which kinds of visuals performed best in 2016. Shockingly, just 7.6% of marketers stated that stock photos had the most impact, despite being the most frequently used type of visual. Meanwhile, 41.5% of marketers said that original graphics, such as infographics and illustrations, performed best. Other high performing kinds of visuals were charts and data visualizations, which 25.7% of marketers claimed lead to the highest engagement. In addition, 20.2% also mentioned that videos and presentations performed best, and only 5% of marketers said that GIFs and memes performed best. 4. How much time was spent a week on making visuals? When asked to share how much time was spent a week producing visual content, 71.1% of marketers claimed that they spent less than five hours a week making visuals. Contrary to that, 11.4% of marketers claimed that they worked more than 15 hours a week on producing engaging visuals for their content strategy, and 17.5% stated that they worked between five and 15 hours a week on visuals. 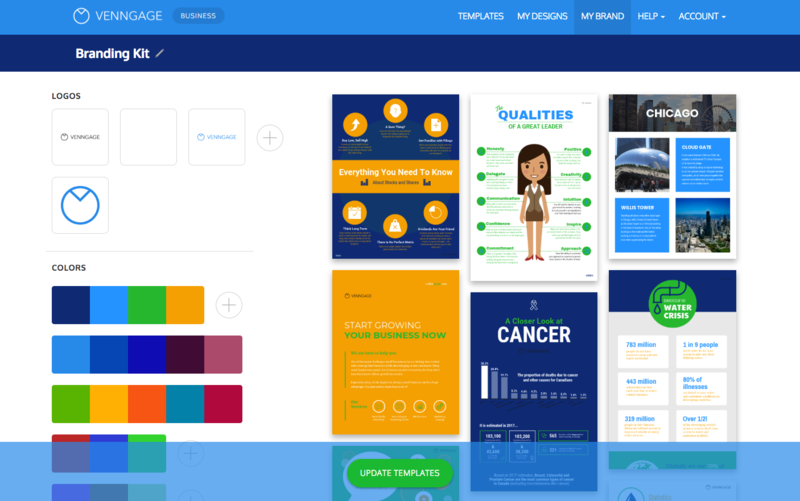 A tool like Venngage takes the heavy lifting out of infographic creation by offering professionally designed templates that could save marketers hours. 5. What methods were used for creating visuals? When asked how marketers created their visual content, 32%–the vast majority–claimed to use an online graphic design tool like Venngage. Following that number, 30.4% said they used an in-house designer. Marketers who used a freelance designer made up 24.1%, and 14.5% stated that they used other means for creating and curating visuals such as Instagram, Flickr and Photoshop. 6. What was the biggest struggle when creating engaging visuals? Next, marketers were asked to share their biggest struggle when it came to creating engaging visuals in 2016. 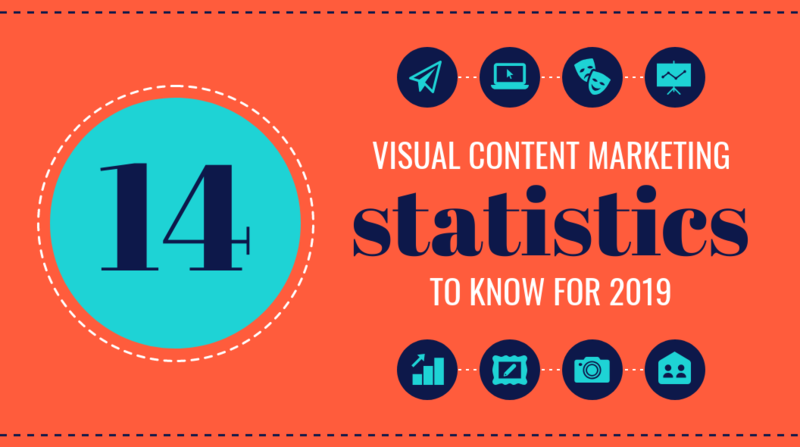 The leading statistic was that 36.7% of marketers struggled with being able to produce visuals on a consistent basis. In second place, 29.1% of marketers struggled with producing well-designed visuals, and 24.1% said they struggled to reach a wider audience with their visuals. Only 10.1% of marketers said their struggled to source reliable and interesting data. 7. How integral is visual content to marketing strategies in 2017? Marketers were asked to express how integral the use of visual content would be to their marketing strategies in 2017. Most marketers, 60.8%, stated that the use of visual content was absolutely necessary to their marketing strategy. Following that, 31.7% said that visual content was very important for their marketing strategies in 2017, while 5% said it was just important, and 1.3% claimed that visual content was only somewhat important. Only 1.3% claimed that visual content was not important at all to their marketing strategy. 8. What percentage of marketing budgets were spent on visual content in 2016? When asked what percentage of their budget was used on visual content in 2016, 31.6% of marketers surveyed said that 0% to 10% of their budget was spent on visual content, and 25.3% of marketers said that 11% to 20% of their budget was spent on visual content. Only 1.3% of marketers claimed that they spent 91% to 100% of their budget on producing visuals for their marketing strategy. 9. How much do marketers project to spend on visual content in 2017? Finally, when asked what they projected to spend on visual content in 2017, 21.5% of marketers stated they planned to spend 0% to 10% of their budget. 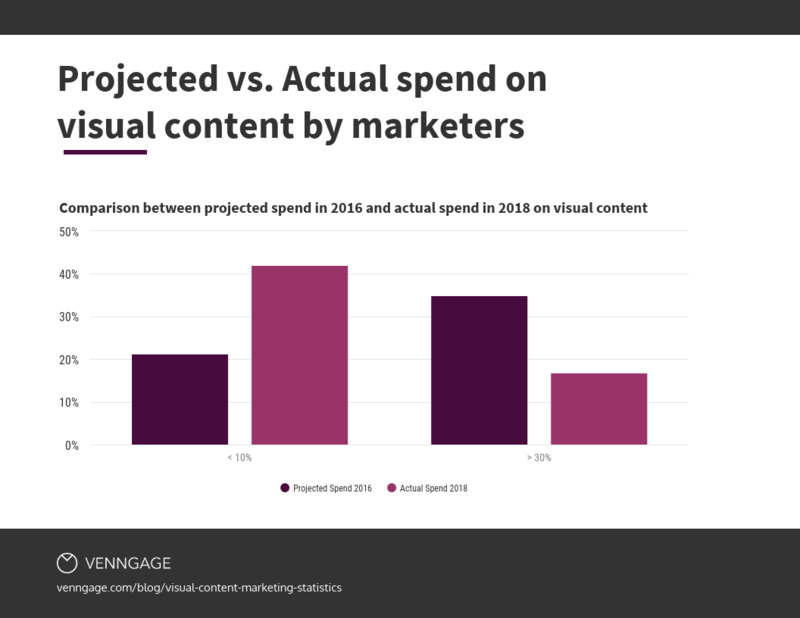 Another 21.5% planned to spend 11-20% of their budget on visual content, yet another 21.5% of marketers surveyed predicted spending 21-30% of their budget on visual content. The remaining 35.5% of marketers predicted they would spend over 31% of their marketing budgets on visual content. Based on the results of this survey, it’s obvious that the majority of marketers understand the incredible value of using visuals in their 2017 marketing strategies In particular, they understand the value of using infographics, charts and data visualizations. The truth is that when there is so much text-based content produced on a daily basis, and even on an hourly basis, you need to test out other forms of content (in conjunction with a solid SEO strategy and reliable SEO checker) to captivate your audience. Make 2017 the year that people remember your brand and get a head start on creating awesome visuals that people will love.